In these harsh economic and political times, there are as many immigrant stories as there are families who immigrate, migrate, or seek asylum. Luca’s Bridge / El puente de Luca is an engaging story of a Mexican family’s trying to make the best of a terrible situation. Mami and Papi, who are not documented, are being deported, and their children, brothers Luca and Paco, are US citizens. They have the “choice” of staying on this side of the border—with their school, their friends, and everything they know—but without their parents; or accompanying their parents to a place they don’t know. The family decides, of course, to stay together. It appears that Llanos wrote this story in one language and then in the other. Young hablantes see a Spanish version that is at least as authentic and beautiful as the English, a poetic interpretation rather than a translation, with much symbolism and metaphor. For instance, Llanos interprets the English beginning: “Sometimes the only way to go back home is to fly…” as “Hay veces en que volar es la única forma de volver…” In this case, there’s a word play in the Spanish between “volar” and “volver,” and the sentence literally translates as, “There are times when flying is the only way to get back.” And in Luca’s Bridge, Luca is, indeed, a migrant, flying home in his dreams, accompanied by the migratory Wilson’s warblers on just about every page. As he looks out the window, Luca imagines himself flying with the flock: —¿Estarán yendo a casa?—he asks himself. Are they going home? And, asleep, Lucas dreams he is napping on the moon, flying back home on a bridge of papel picado, playing his trumpet and leading a marching band, and laughing, laughing, laughing. Luca’s Bridge is a story of hard choices that should not be necessary: to break up your family so that your children might have a better, maybe safer, future without you; or stay together and live in uncertainly and quite possibly, poverty. As Luca plays his trumpet, “(His family’s) eyes sparkled. And for a moment, their sadness seemed to fly away through the open window.” / “los ojos les brillaban, y por ese momento, su tristeza salió por la ventana.” In their imaginations, they’re together, with each other, with the migratory warblers, at home in two places. In almost every illustration, observant readers encounter bright images of yellow-and-black Wilson’s warblers—sometimes tiny and sometimes large, sometimes in a flock and sometimes alone, and sometimes reflected as wings on Luca’s trumpet or in the design of several beautiful papel picado. There’s even one perched on the back of a chair, right near family photos on a wall. These birds are migrants without borders—their habitats ranging with the seasons all the way from Alaska to northern South America—and their presence here will especially resonate with young people whose families also move back and forth. As well, young readers will notice the subliminal messages carried in López Real’s colorful spot images. 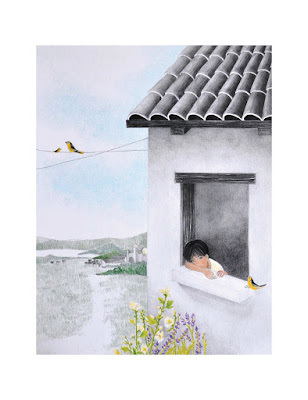 On one page, for instance, there’s a patch of wildflowers growing just outside the window of Abuela’s little house. A sad, pensive Luca is leaning out the window while a tiny warbler perches on the sill, keeping him company and possibly offering consolation. There’s so much more to tug at the heart. At supper, for instance, Abuela mentions a dicho—“Donde come uno, comen dos” (“Where one eats, two eat”)—and then has to translate it for Luca and Paco, who don’t speak Spanish. 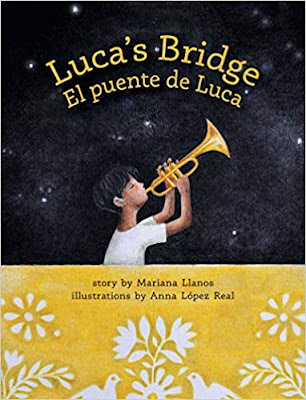 Without didacticism, without polemic, Llanos’ and López Real’s intent in Luca’s Bridge / El puente de Luca is to spark discussion among the youngest children about what it might be like to experience immigration and deportation, and that sometimes—only sometimes—there might be hope in what appears to be hopeless situations. It’s highly recommended. Enjoyed reading this review. We will definitely have to buy this book!